Hikone traces its origins to the early 17th century, when a cluster of Samurai residences and commercial establishments grew up at the foot of the castle of the local lord. Today, Hikone possesses a rich combination of traditional and modern Japan with its architecture and small town atmosphere supported by a progressive government and thriving economy. Hikone lies on the eastern shore of Lake Biwa, the country's largest lake and has a population of about 100,000. Distinct seasons and rich natural surroundings give Hikone an appealing year-round beauty. 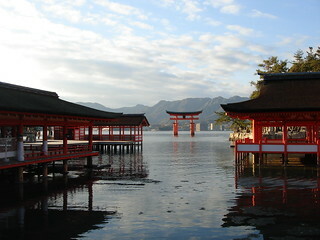 While serving as a center of industry and transportation, the city also attracts visitors from around Japan and overseas. Hikone Castle, standing in elegant profile against Lake Biwa, is both the city's symbol and its main attraction. Hobart and William Smith Colleges are an affiliate member of the Japan Center for Michigan Universities (JCMU) in Hikone, Japan, which offers a program in contemporary Japanese language and culture every fall semester. The JCMU complex, located on Lake Biwa, includes classrooms, a library, state-of-the-art language labs, a student residence, and a traditional Japanese tea room. This course will be offered at four different levels; the appropriate level for each student will be determined by a placement exam administered at the beginning of the program. With permission, students may be allowed to substitute another elective (if available) or may pursue an independent study project in place of this course. This program is suited for students with a major or minor in Asian Languages and Cultures or those who want to improve their Japanese language skills. The program is open only to HWS seniors who have a keen interest in Japan and who are in good academic and social standing with a minimum GPA of 2.5. In addition, applicants are required to have at least one year of college-level Japanese or the equivalent. Due to the challenging nature of study abroad, student academic and disciplinary records will be carefully screened. Participants will spend the first few weeks of the program housed in a JCMU dormitory, after which those with advanced Japanese language skills will be placed with host families in the Hikone area, as arranged by the local housing coordinator. Those with less advanced language skills may reside in a homestay if a suitable family is available. If not, these students will remain in the dorm. The cost of commuting is included in the program fee although many students will be able to walk or bicycle to the JCMU complex from their homestay location. While in the dormitory, students will be responsible for their own meals. Host families will provide two meals per day during the week and full board on the weekends. Please see “Going Abroad with the CGE” below for more detail on the board plan. The calendar of JCMU is designed to allow students ample opportunity for independent travel in Japan both during and after the academic term. Many local or regional trips are also possible. Hikone is a 45-90 minute train trip from the large, cosmopolitan cities of Kyoto, Nagoya and Osaka. Students will be charged standard HWS tuition and fees, room fees, and a $600 administrative fee. This will cover credit for a four-course semester, health insurance, class-related excursions, and accommodation. Note that no HWS board fee will be charged. Students should plan to bring their board fee to cover meal expenses. Additional expenses not covered include airfare, books and personal expenses (laundry, entertainment and independent travel). We estimate airfare for this program at $1200-$1400 from the East Coast and books at $250. It is difficult to give an accurate estimate of personal expenses because student spending habits differ considerably. We would suggest a minimum of $1,500 above and beyond meal expenses. However, students on a tight budget should be able to manage with less. If you are concerned about finances, we strongly encourage you to talk to the CGE staff who can offer information and advice based on your specific situation. Note that HWS students participating in the Hikone program may apply for a grant through The Study in Japan Endowment Fund. For more information, please contact Associate Dean for Global Education Tom D’Agostino at tdagostino@hws.edu.